Viewing topic "Motif and Reason 9.5"
I own a Motif 8 Classic and a Motif 7 XS. It’s been a while that I’ve done some music due to circumstances but getting back into it. I’ll say right away that I never really liked Cubase. Sorry, I gave it a shot but just didn’t like it and so I left it for what it was. A friend of mine showed me Reason and that just appealed to me so I bought it this weekend and I’m starting to learn how to use it, which is fun. Now, of course I had in the back of my mind that it would be great if I could hook my synths up, especially the Classic. And today Reason 9.5 introduced VST support for Reason, so in theory that should make it easier to hook my synths up to my PC and Reason. I see there are some studio and editor downloads and some usb drivers for connecting the synths and frankly I need help figuring out how to do this, in which order etc. Some of it seems old so I wonder how it all works with Windows 10 and all that. So, if anyone can help me out with what the best approach is to get my Motifs to work on my PC and Reason 9.5 that would really be great. I have almost the exact situation here at home. i have recently purchased reason 9 and i am trying to connect my motif xs6 through USB. i admit to not being very good at software programs and installing programs but i see there is alot of other people with similar problems of not being able to connect the motif xs to the computer by usb. i would greatly appreciate it if someone would be able to give straight directions on how to connect this hardware on computer. 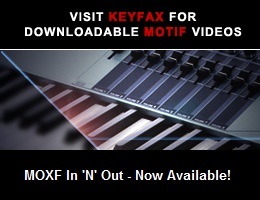 i have windows 10 and i’am looking to download the proper driver for the motif xs6 in order to connect as a midi controller to reason 9 or 9.5..
To connect to Reason via USB for any Motif all you need to install is the latest Yamaha USB driver for your computer’s OS. When setting up Remote Mode (see the Reference Manual) if you select Cubase, the Motif will be recognized as a Mackie Control device. Not all of the remote features will work but the basic transport, track select/arm/mute/solo, volume and pan will work fine. Read the Reason manual for details on how to set up your default keyboard and your default controller. Reason does not support VST3, so you cannot use the VST Editor for the XS. When using your Motif in song/pattern mode as a multitimbral instrument, you will need to create one external MIDI device in Reason for each MIDI channel you need to drive. You then must connect the audio outs of the Motif into Reason’s audio inputs via your interface. As on most DAWs the MIDI and audio are totally separated which can be confusing at first.